Here you will be getting 1 new factory gasket kit that will work for your 1974 to 1985 12A. This kit will have all the gaskets and coolant O-rings needed to reassemble the engine and put it back in the car. You will still need a rotor kit as this gasket kit does NOT have any rotor related parts to complete a full rebuild on your engine. Mazda's part # for this is. Atkins Rotary is expanding its operations to include all of Mazda's Lineup. More than just rotary parts, now we stock piston parts as well! We have been in business in Washington State since 1982, We manufacture and sell quality parts for your Rx! Thanks for stopping by and have a zoom zoom day! 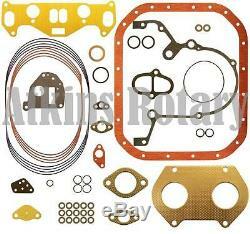 The item "Mazda 12A 12-A Factory Engine Gasket Kit (N201-89-100)" is in sale since Friday, May 6, 2011.